PhotoLapse is a free program for Microsoft Windows to create time-lapse movies from photos that you load in the program. Time-lapse movies are movies that are created out of many still photos of the same location. You might have seen these effects on TV in shows that explain how something big, like ships or buildings, get build. What many people do not know is that it is extremely easy to create these time-lapse movies. All that is needed is a collection of photos that show the same location and the software PhotoLapse. Probably the easiest way to obtain photos of the same location is to use a webcam to create a photo every x seconds. These photos can then be turned into a time-lapse movie with the PhotoLapse software. PhotoLapse is a tiny software program that has been designed for this purpose. The portable software program can be started right after the download has finished. 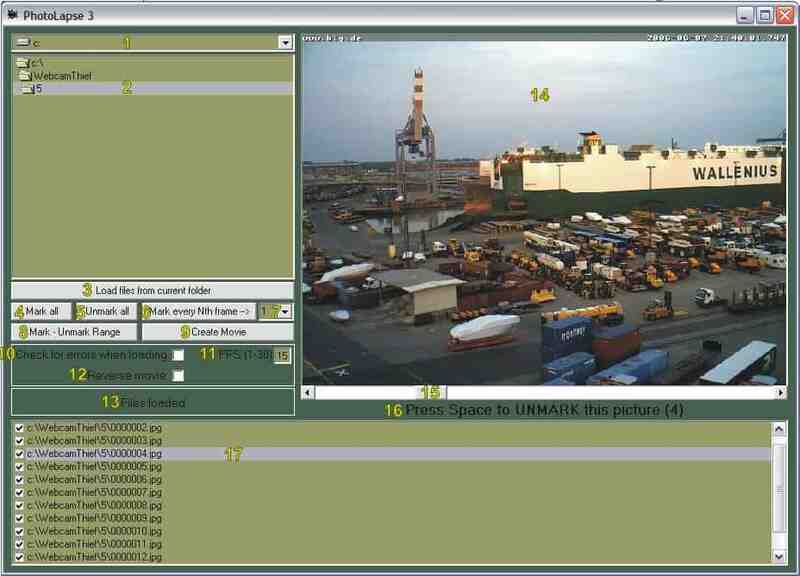 The interface consists of a file browser to select photos from the local computer system, a preview area and some available settings. All it takes to create a time-lapse movie is to select the photos from the local computer system. It is possible to load files from a folder and select some or all of them for the movie. A few optional settings can be configured including the frame rate (default 15, between 1-30), error checks and if the movie should be reversed. A click on the create movie button will start the process. A compatible codec needs to be available on the computer system. The program will automatically display all codecs giving the user the choice of the codec for the time-lapse movie. The process takes a while largely depending on the video codec and the number and size of the selected photos. The portable software program PhotoLapse is compatible with most Windows operating systems. It can be downloaded from the developer's website. Time-lapse movie examples are available at all popular video portals including YouTube or Google Video. Hi! if the program had the function to capture frames from webcam, could be ok! great recommendation. i tried many programs (including some frustrations with imovie and iphoto). this program worked great! thanks. Thanks for letting me know, I have uploaded the application to our own server. You can download it from there right away.